I’ve always loved to travel and discover new countries and I’ve been lucky in my adult life to venture to some wonderful places. Whenever we decide to go on holiday I spend ages researching places and types of holidays that we can go on. Since having the girls there are more things to consider and factor in. 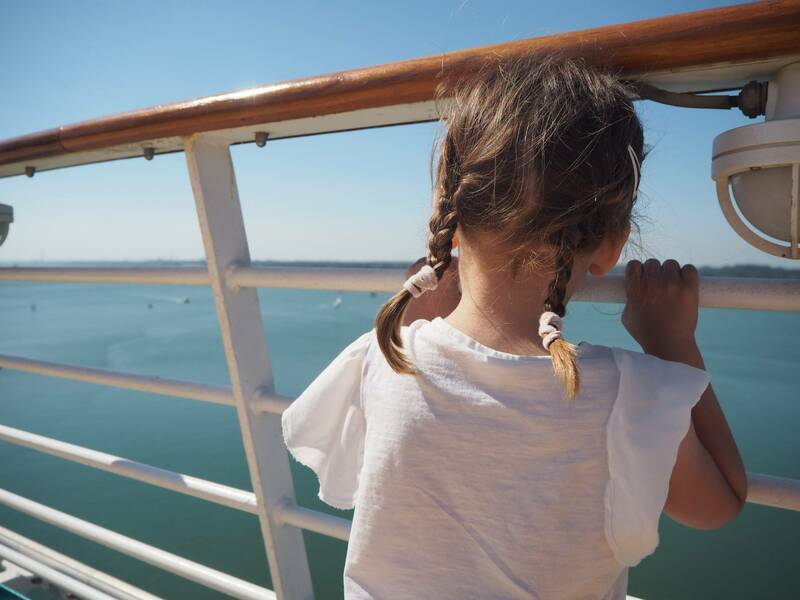 One type of holiday that I’ve never considered and not really looked into, especially for families is going on a cruise. 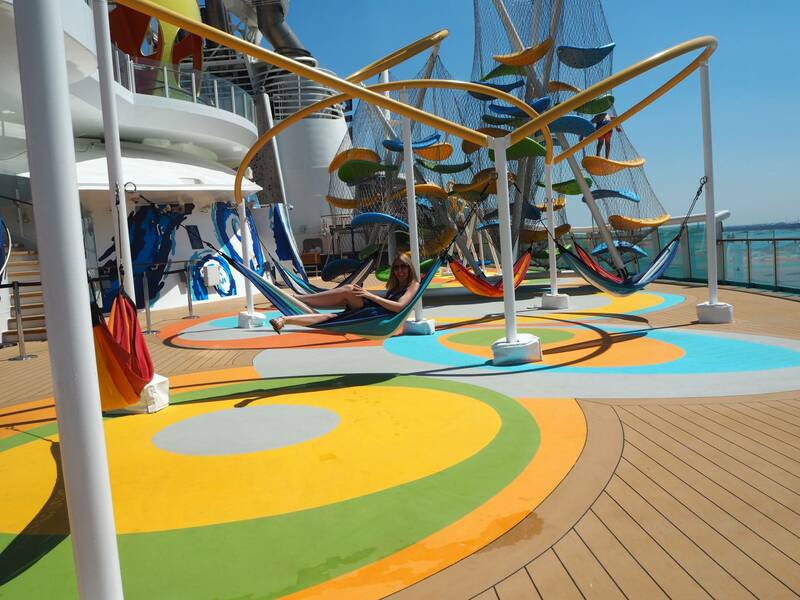 I had visions of us being stuck on this ship with 2 young children and not a lot to do to entertain them. How wrong was I! 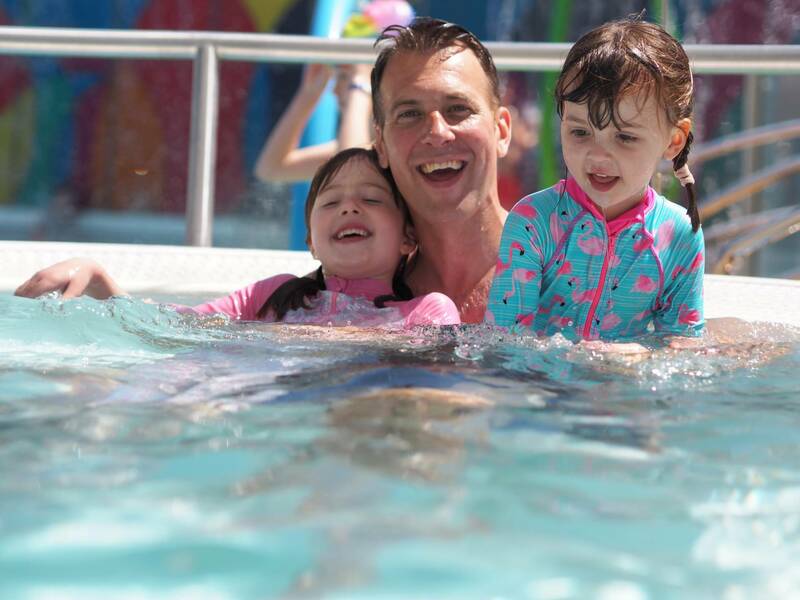 Last weekend we were invited to go on board the Royal Caribbean Independence Of The Seas and I literally squealed with delight, having seen photos of it and knowing that they had a waterpark on the top deck, I knew my girls were going to love it. It has recently had a refurbishment and I couldn’t wait to see what they had done. 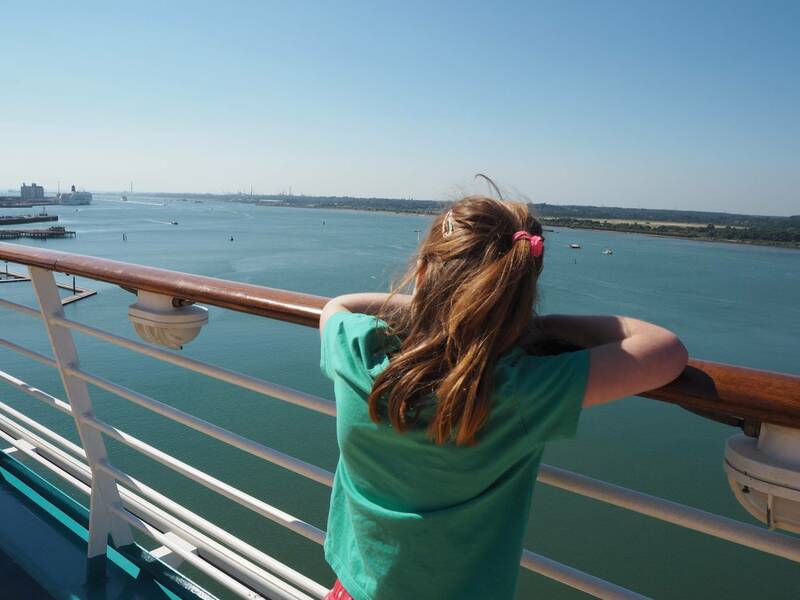 We couldn’t have been more lucky with the weather and as we left the house bright and early for the short trip to Southampton to board the ship, the girls were getting more and more excited. As we parked the car and walked over to the ship, Alice (and I) couldn’t get over how big it actually is. I mean it’s crazy big! 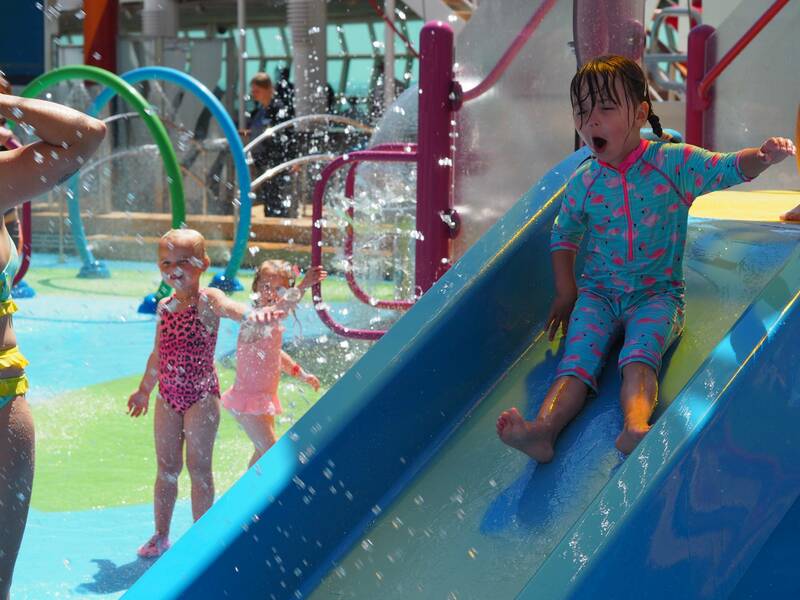 Once we were onboard we headed to the top deck and the girls got their first sight of Sharkbay the water park and they couldn’t wait to go in there after lunch. Around the top deck is a running track for those people who like to do a bit of exercise and of course its great fun for children too. My girls loved having races up and down it. Alice was amazed at how high up we were and how far she could see. 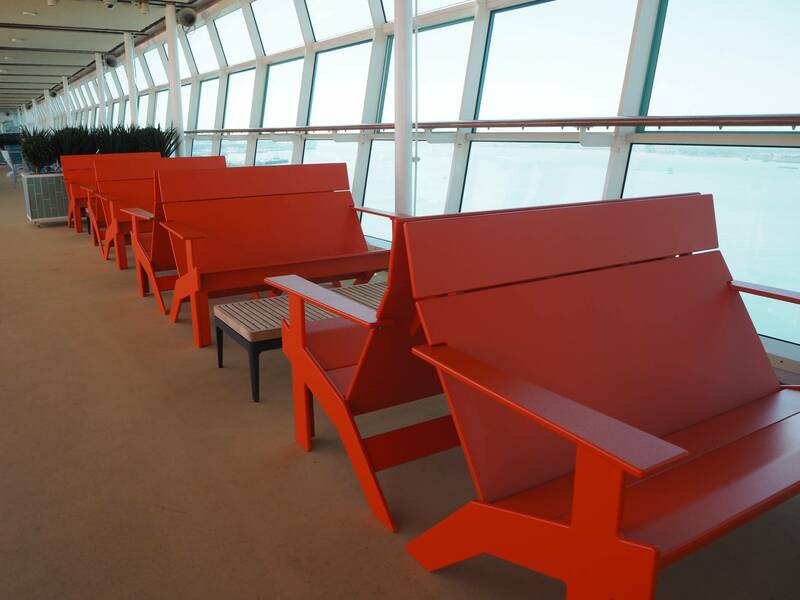 There was lots of different seating areas, as well as sun loungers all around the edge of the ship to give you some amazing views. 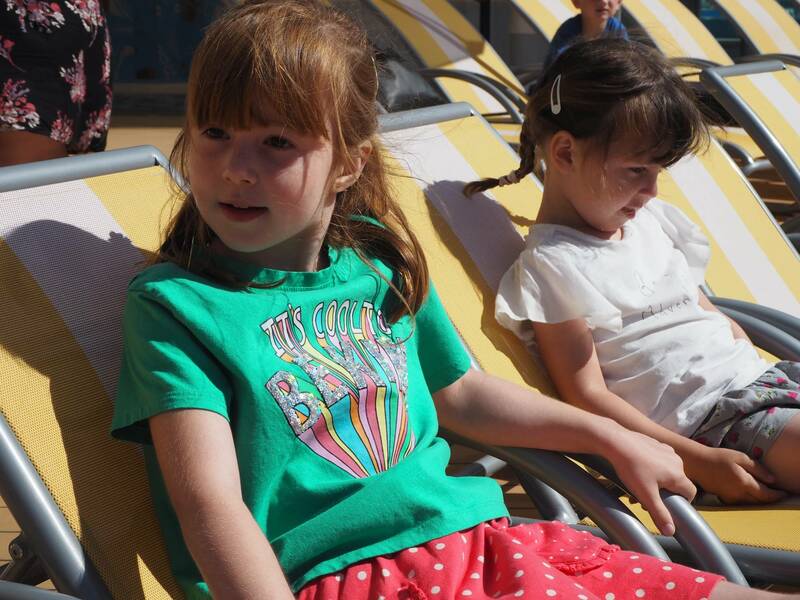 They even had children size sun loungers which I’ve never seen before and the girls loved them. We then headed inside the ship to see what it was like. There is a long strip, a bit like a high street with shops, cafes and a sweet shop with a man outside giving the children a little pot with 2 sweets in to try which was really lovely and of course they loved it! Everywhere you looked it just screamed luxury, but not in a way that made you feel uncomfortable. We didn’t feel out of place with our children making noise, and getting excited about everything they could see. In one of the cafes, there was coffee, tea and water tanks where you can go and help yourself throughout the day. There was a car in the middle of the strip and Holly was so desperate to get in it. I wasn’t sure if they were allowed to or not, so she just looked longingly at it. 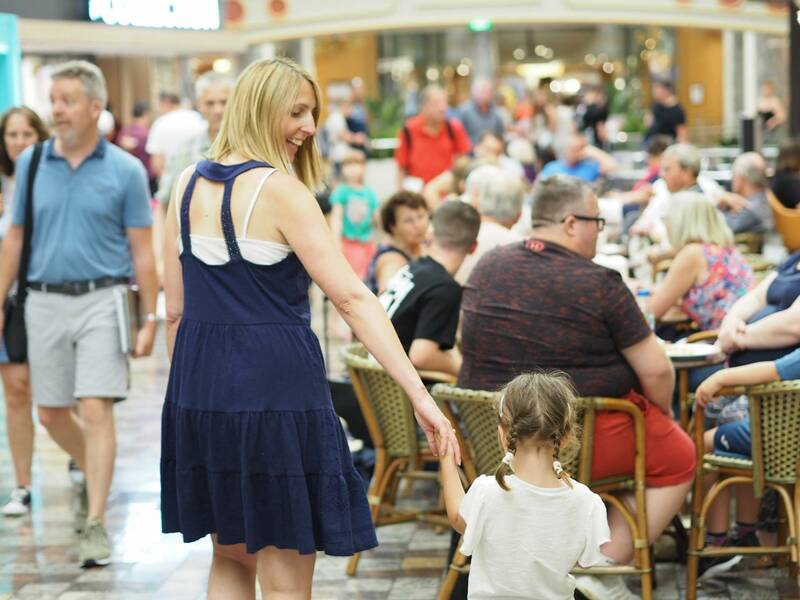 It was pretty busy, but my dad who has been on a few cruises says it’s always like that on the first day as everyone is desperate to see and do everything and it calms down as the cruise goes on. 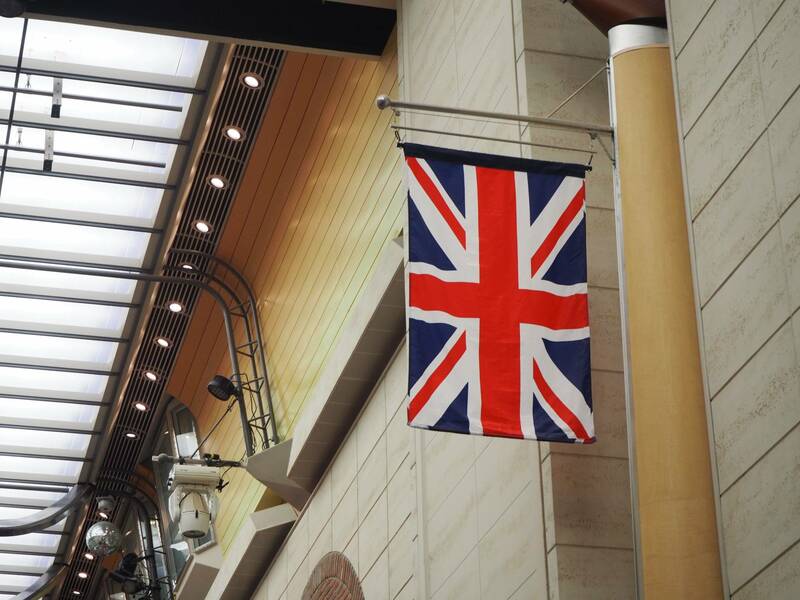 When it comes to restaurants there are lots of different options, there is a beautiful rather posh restaurants that is over 3 floors that you can have dinner in. 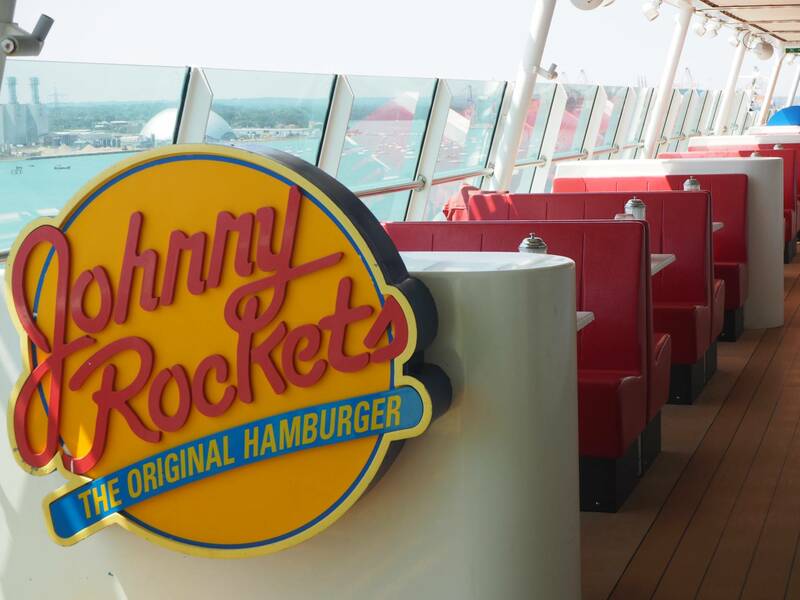 At the back end of the ship there is Johnny Rockets the hamburger restaurant which looked cool. 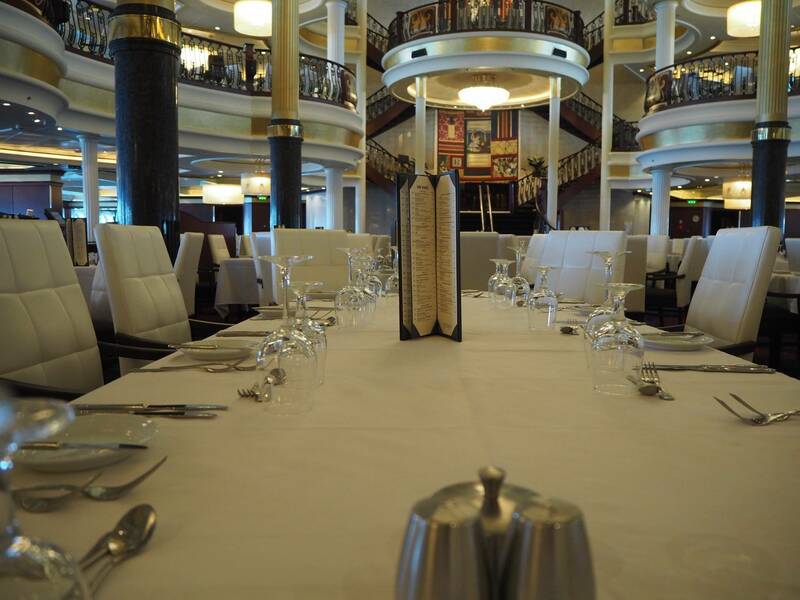 We ate in the Windjammer restaurant which is the main self service restaurant in the middle of the ship. 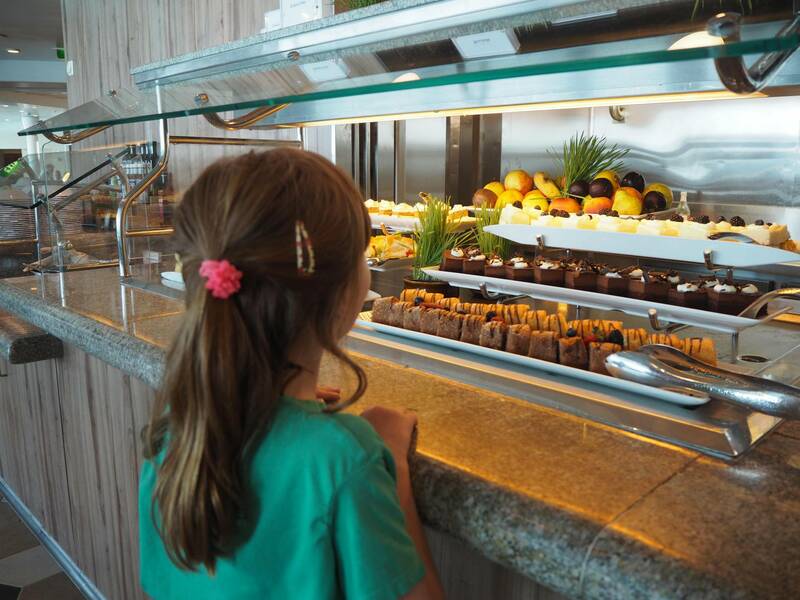 There was a wide variety of different styles of food and something to suit everyone. A particular highlight of our day is as you walk into the restaurant there is a man playing a guitar singing a song all about washing your hands! Yes, you read that right. As you walk in there are large sinks either side for everyone to wash their hands before entering the restaurant. Hygiene is a big thing onboard the ship. Alice couldn’t get over how much food there was too choose from and was eyeing up the cakes from the start. The great thing is you can take the food out of the restaurant and eat outside if you wish too. We had lunch with a view. 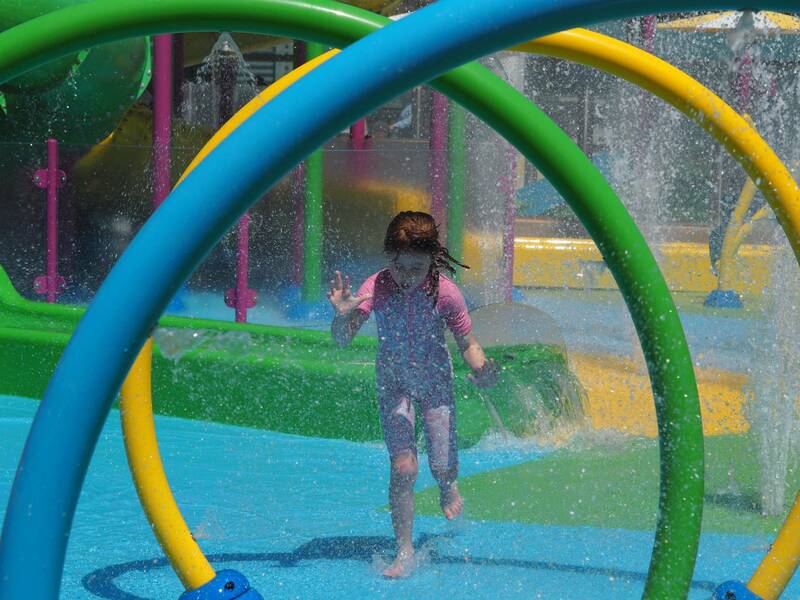 With lunch finished there was only one place that my girls wanted to be on a hot sunny day and that was in Sharkbay and I don’t blame them it looked like a lot of fun. 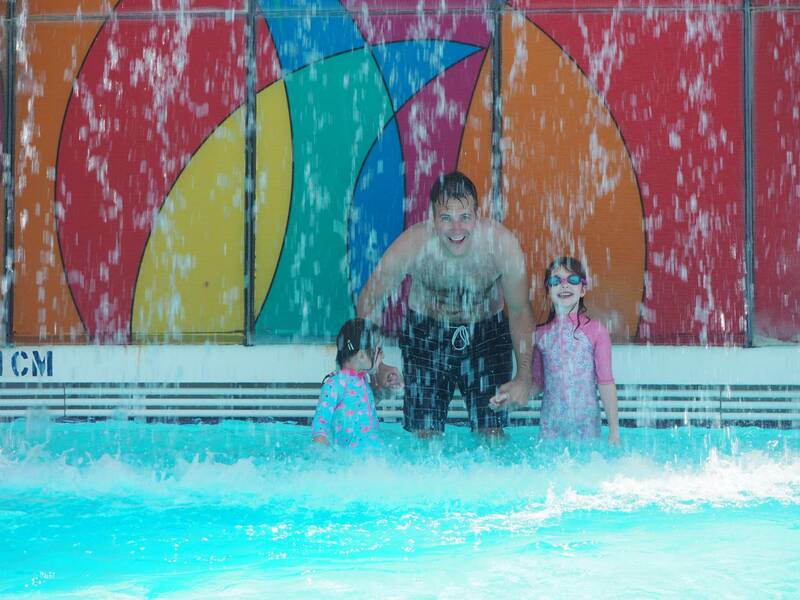 Once they were changed and plenty of suncream on, they couldn’t wait to get wet. 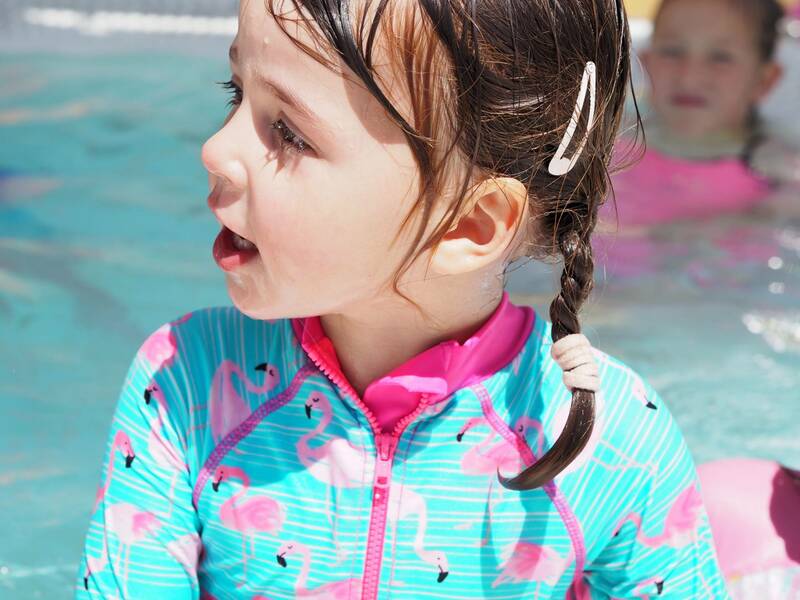 Both my girls are water babies and they were in their element. 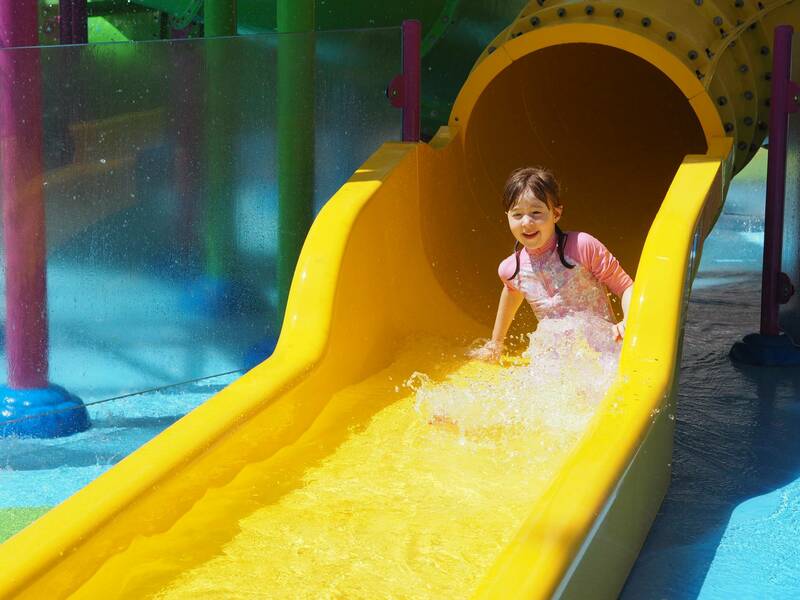 Alice wasted no time in wanting to go down they yellow waterslide. Holly loved the smaller blue slide and she literally went up and down it for ages. so cute! 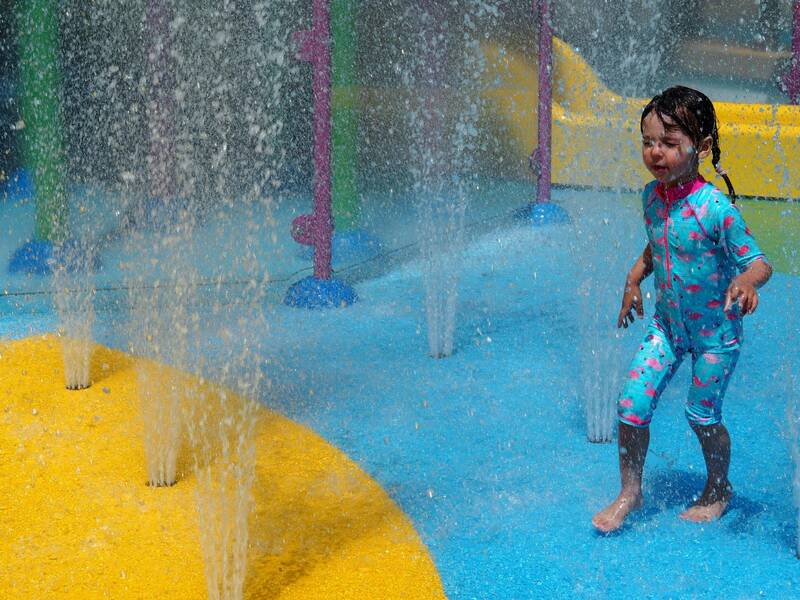 They both loved running through all the water fountains and colourful rings. There were two hot tubs within Sharkbay and this was definitely one of their favourite places to go. Probably because it was nice and warm. Andy loved it as it gave him a rest too! This is probably one of my favourite photos of my girls. 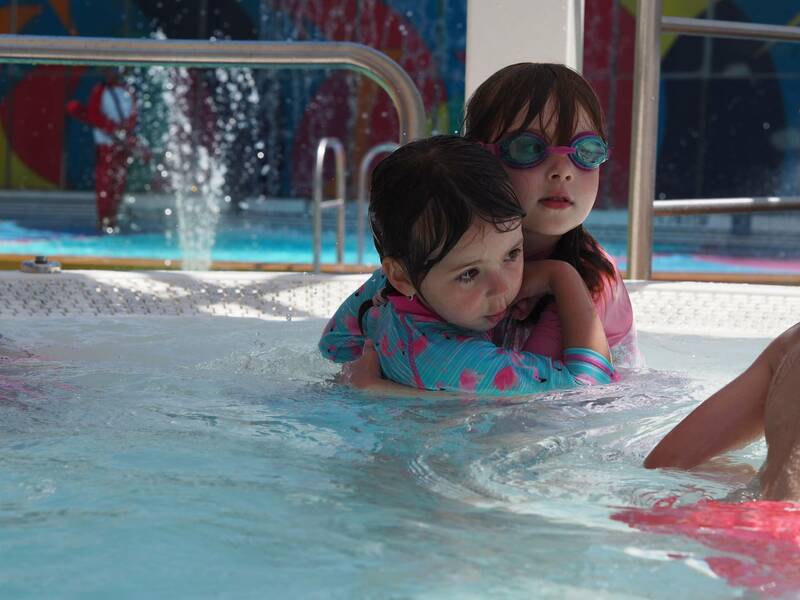 They love each other so much and are always really loving towards each other, even in the pool. These are the moments and the memories I want to make for them. There was a pool area too, where they could swim and go underneath this large waterfall which was great fun. This giant rainbow wall separated the 2 pool areas and the other side was a quieter pool. At the other end of the ship is the FlowRider which is where you can try out surfing and it looked like great fun. 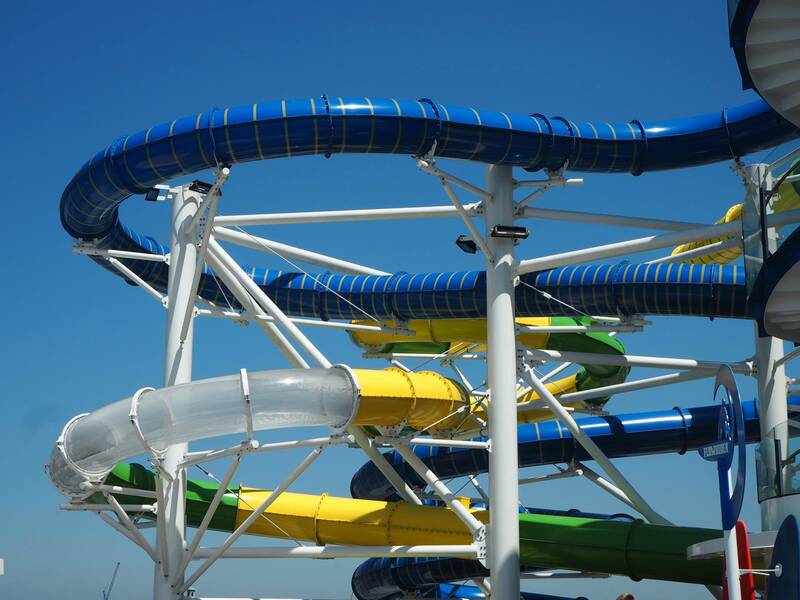 There was also The Perfect Storm waterslides which are the ones you can see on top of the ship and they look like fun. I think that after a couple of days to warm up to them, Alice would’ve been down them a lot. You really get an idea of how big the ship is and how high you are, with amazing views! 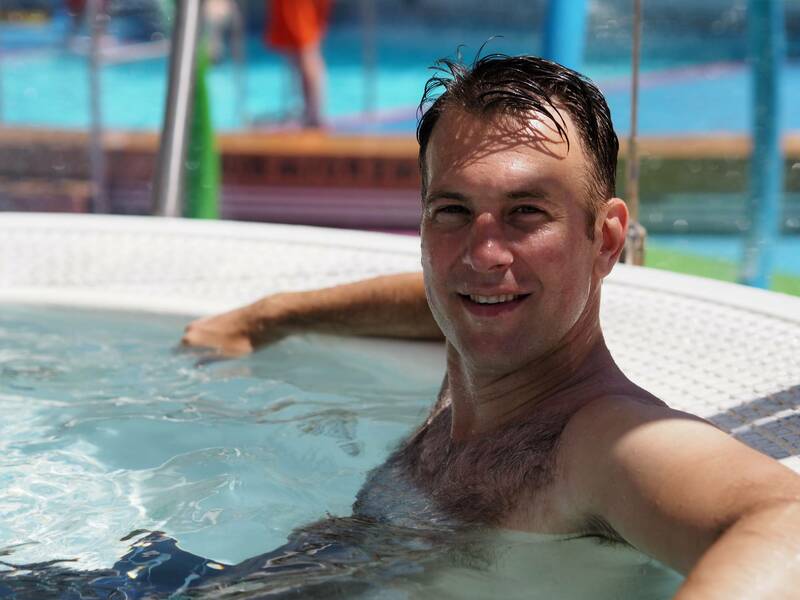 Next to the FlowRider is a children’s play area and some hammocks, which of course I had to try out! 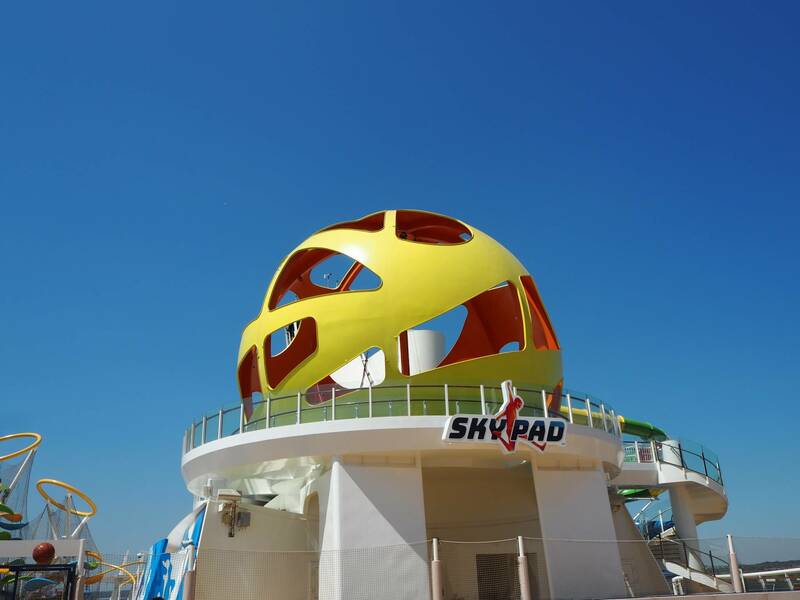 Also at this end of the ship is a rock climbing wall and the SkyPad, where you can go on a trampoline whilst attached to a bungee. Unfortunately they were not open and we couldn’t try them out. Seeing the world through the eyes of my three year old, I can only imagine what it must be like for her to see the world like this. 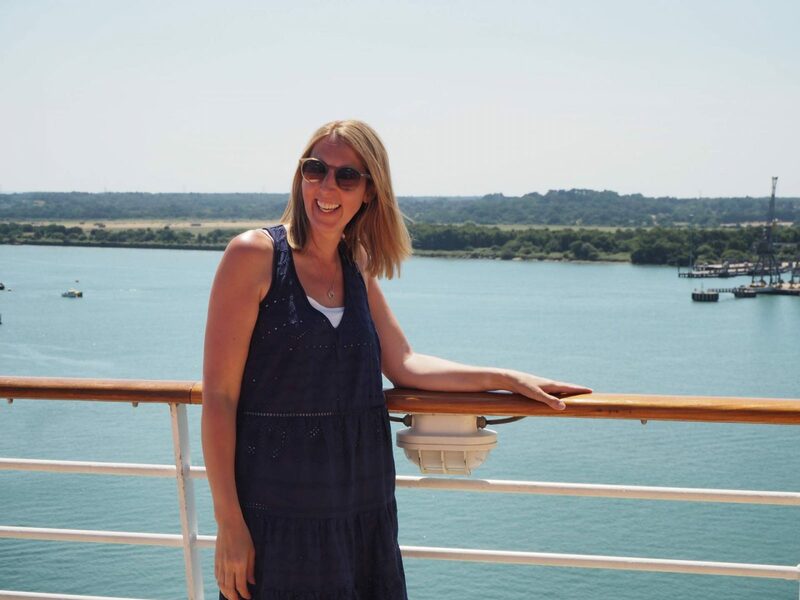 We had a truly amazing time and there was still so much we didn’t get to see, like the crazy golf, the full size theatre and a chance to see the staterooms where the passengers sleep. 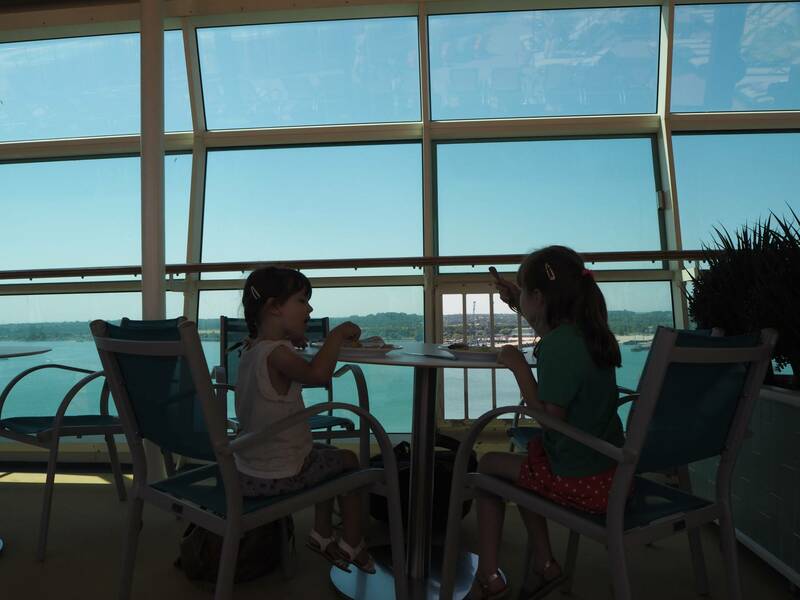 I can’t thank Royal Caribbean enough for inviting us onboard, the girls haven’t stopped talking about the ship since we left and are asking when they get to go back. I think we can safely say that we’ve had our eyes opened to taking a cruise with the girls. There was just so much to do for them and us. Now we just need to get saving! 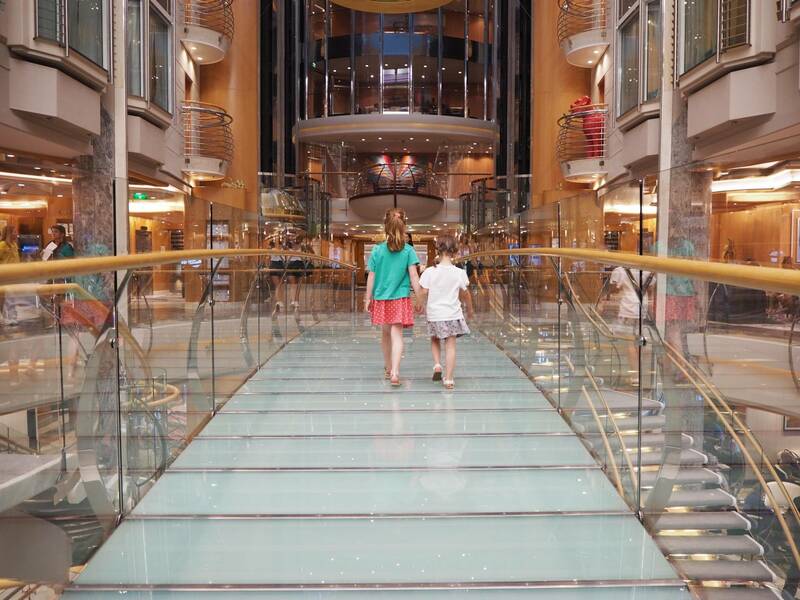 Disclosure: This post is in collaboration with Royal Caribbean who we’re working with. What a gorgeous ship! That is making me so excited about the cruise we are going on this summer!!! 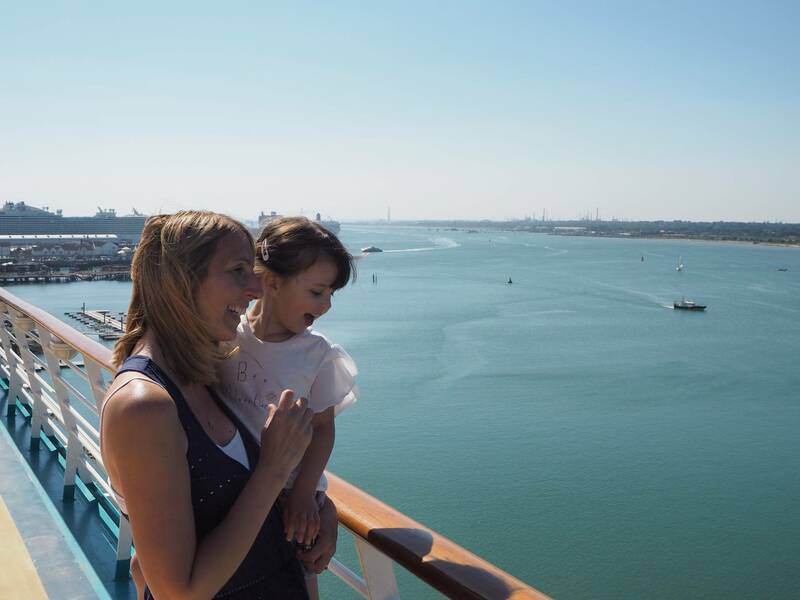 I’m yet to try out Royal Caribbean, having tried out a few other cruise lines. Indy looks fabulous! Ive never been on a cruise ship before or even been up close to one, but they look huge and awesome! I really want to do a cruise but hubby isn’t keen, Im working on him though! Looks like there was loads to entertain the littles which is great! Ahh Laura, this just looks so incredible! 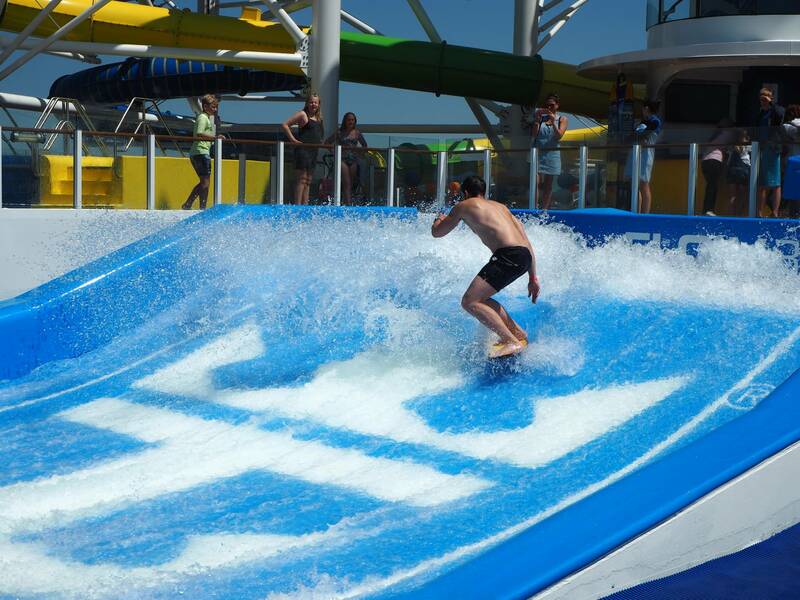 That waterpark is awesome and flowrider looks like just our sort of thing too. 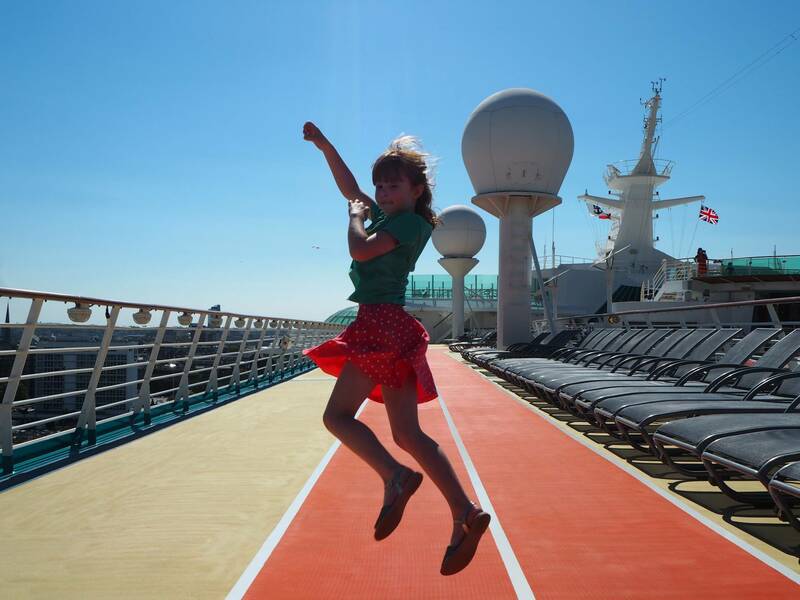 I had no idea there was quite so much to do on cruise ships for children, it’s literally a dream holiday isn’t it? What an amazing ship. I can’t believe there are slides on it. My kids would love it. Ok that water park is incredible. How is that in a cruise ship. 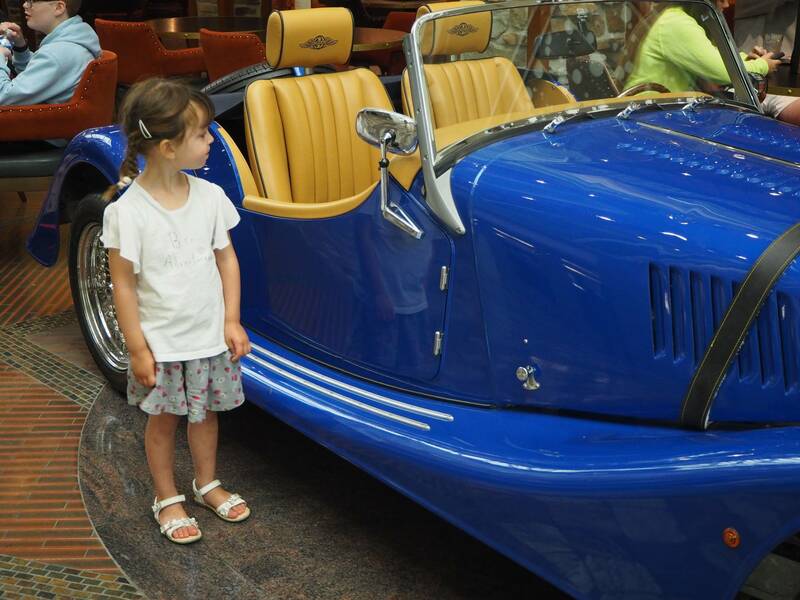 I agree it really does scream luxury and no wonder you were so excited to have a look and experience it! 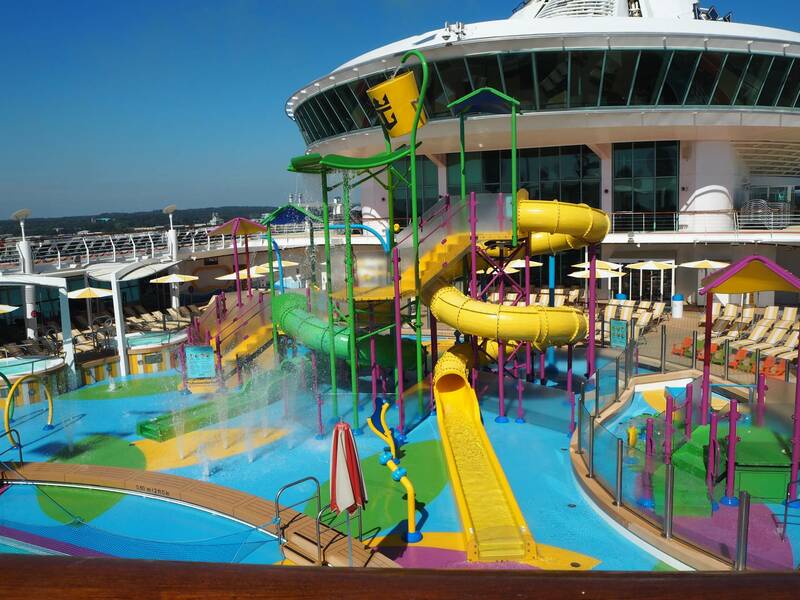 I can’t believe there is such an amazing water park on a cruise ship. My family would love it! What an amazing and luxurious experience, in hopes taking my parents to more places I have considered a cruise holiday but she is not keen. That waterpark looks amazing! 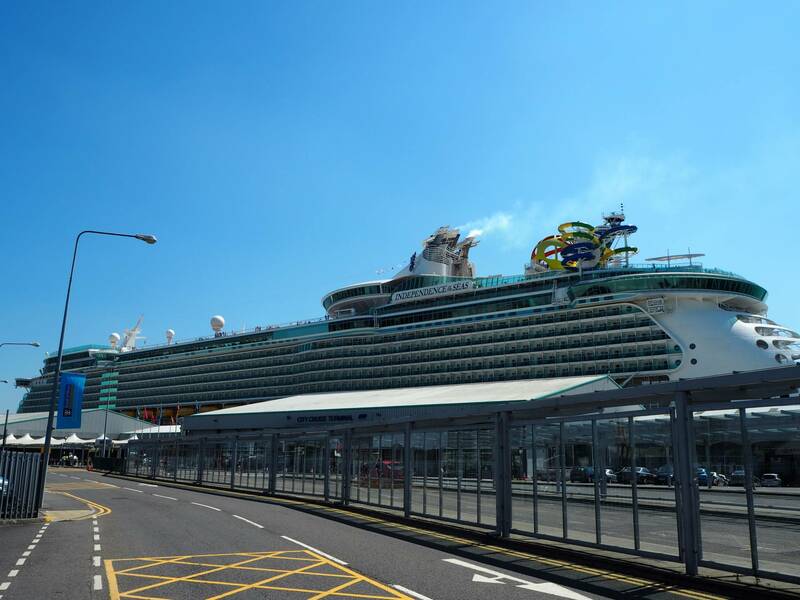 I’m always so overwhelmed by the thought of a cruise ship – they’re massive! Was there much for teenagers, did you see? Wow this looks fab, that waterpark is amazing! I’ve never considered a cruise either but it does look good fun!